Though movies made in Tamil in recent years are quantitatively high, the quality and content invariably leave much to be desired. 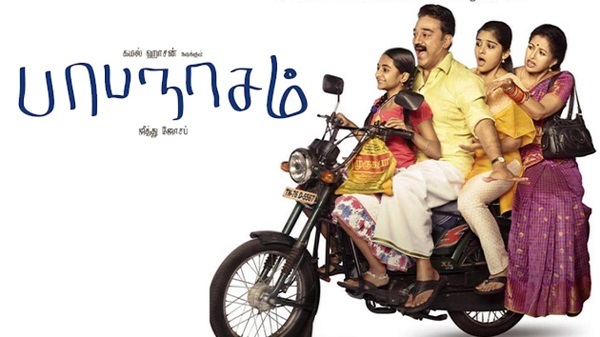 Kamalhassan, the top star and an actor with exceptional talents has emerged poignantly in his recent release titled ‘Papanasam’ in Tamil, a remake of Malayalam hit film ‘Drishyam’. Comparisons are odious; But, in a movie almost faithfully followed the original by the same writer director Jeethu Joseph had definitely added several subtle nuances in the remake by locating the story in a down South small township with a characteristic lingo of that place. A more nuanced performance of Kamalhassan turns out to be the speciality of this remake. Suyambulingam is a typical villager with less education, a movie buff but with more common sense coupled with presence of mind. His love for his close-knit family comprising of his wife Rani (Gowthami), two teenage daughters Selvi (Nivedha Thomas), and Pulli Meena (Esther Anil) is robust and he is ready to go to any extent to safeguard his family. An unintended murder and the suspicion which is targeted towards his family bring turbulence in the placid calm family. How, Suyambulingam circumvents it forms the story. In fact, it is one of the best and brilliant screenplays I have come across in recent years. To be honest, the hero of this movie is Jeethu Joseph and not exactly Kamalhassan. What the versatile actor had done was garnishing the movie with his impeccable dialect of Tirunelveli and a power packed performance. Kamal in this movie is more natural than the many larger than life characters which were more striking and irking in his past few movies. Asha Sarath’s portrayal of the intelligent and ruthless IG hounding the family to get the truth was highly laudable. The other supporting characters are significant in their own way. The movie initially moves at a laid back pace to compensate for the racy second half of gripping proceedings. Because of this, the three hour movie is not exhausting but completely engrossing. A must watch for those who want to see a good, intelligent movie and Kamalhassan’s ardent fans.